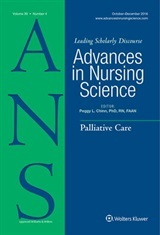 It is an honor to have our manuscript published in Advances in Nursing Science. As a nurse educator I have strived to find an instrument that is useful to measure students’ learning outcomes. Previous literature has offered a lot of significant works, but some of the content or items in the existing instruments were not suitable for my needs. I needed an instrument that is not only valid for varied types of students, but also one that shows the strength and weakness of the students. The use of Mokken scaling analysis seemed suitable to expand the possibilities of assessment outcomes. In my role as a Director, Department of Nursing I hope that the results of assessing nursing students using this approach can provide information for further educational improvement. My co-author, Dr. Watson is a respected scholar and also a wonderful mentor for my research career. We are grateful for this opportunity to share our work in ANS and in this blog post. I hope you find our work is helpful to develop a new measure, and I look forward to your comments. To examine their work further, visit the ANS web site now, and you can download a copy at no cost while the article is featured!